PGBS, provides immaculate quality fixed layout ePUB conversion services. This highly attractive, instructive and interactive option is best suited for business guides, academic publications, learning materials, travel guides, restaurant guide, cookbooks and children’s books. This conversion, when it comes to layout and formatting provides high standard and professional eBooks. Why should you prefer fixed layout ebook conversion? In a fixed-layout eBook, the text does not re-flow and ePub pages will always look the same across thus preserving the printed page layout. Plethora of facilities including text search, thumbnail navigation, dictionary linking, bookmark as well as zooming is possible. Incorporation of audio, video and ‘reading to the user’ features are enabled. At PGBS, the very first process initiated is a discussion with the client to understand their exact requirements. Our team analyzes and understands your business and all related factors before suggesting you an optimal ePublishing solutions that are most feasible and profitable for your business. Then we proceed towards finalizing the deadlines and confirmation regarding guidelines and preferences if any. 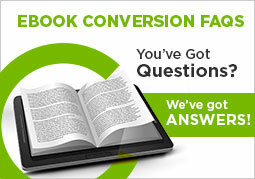 Why choose us for fixed layout eBook conversion services? Being preferred by several clients from different industry verticals, we believe that it’s our possession of certain unique virtues that have retained us confident and motivated to keep on chasing excellence. Our team has years of industry experience in digital transformation solutions. We have worked for different niche businesses from across the globe. This has always helped us in understanding various client requirements with ease and providing them with exciting results. We are obsessed to assure client satisfaction. For the same, we cling firmly to the client specifications. There is a specialized quality team with us that double check each and every element of the whole process and final product before delivering it to you. The e-books we create are tested for validity and adherence to the guidelines and conditions so as to make sure that they have complied with Google, Kobo, Apple, Amazon, Barnes & Noble. Our customer support team is available round the clock to assist you with any support or queries regarding fixed layout format. Above all, to provide you with an insight of our quality we offer a free trial job with no cost or obligation. With the trusted and most-preferred fixed layout ePub conversion services in India that is the epitome of unswerving quality, ground-breaking delivery processes and competitive costing options, we can meet all your specific requirements and demanding challenges when it comes to ePub conversion services.